Expanded Digital Edition Available for Amazon Kindle devices and apps! The expanded electronic edition of Collect All 21! includes interviews with Star Wars cast and crew members reflecting on the saga’s impact from both first-generation-fan standpoints and a career spent bringing the universe to life on-screen. When the original Star Wars hit theaters in May 1977, I was six years old. Thirty years later, I celebrated the anniversary of the film’s release with a series of essays and a National Public Radio affiliate commentary about growing up in the age of George Lucas’ original space trilogy. Those essays grew into a year-long project culminating in the publication of Collect All 21! 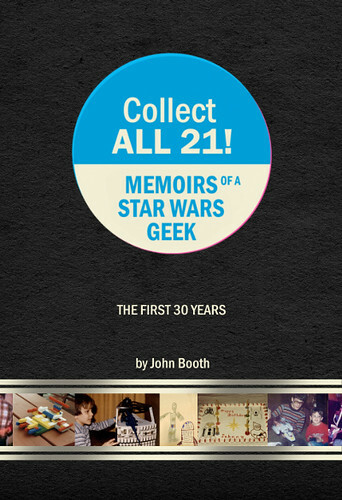 Memoirs of a Star Wars Geek – The First 30 Years. The 1980s are revisited, in all their bad-haircuts-and-Atari glory, from those early years of action figures and playground battles, through the Golden Age of The Empire Strikes Back and the goosebump thrill of seeing Return of the Jedi as a 12-year-old on opening night. But I also wanted to move beyond that decade and straight-up nostalgia to look at how the Star Wars saga and my fandom evolved through the lean years when the movies were far from the mainstream consciousness, through some difficult personal times in the early 1990s, and on into the Special Editions and the Prequel Era, when I got to experience the films as a parent and share them with my daughter. I spent a lot of time in the fall of 1980 in the Belden Village Mall Waldenbooks coveting the shrink-wrapped stack of Ralph McQuarrie’s The Empire Strikes Backportfolios. Made no secret of the fact I wanted this thing for Christmas. Bad. And I remember without a doubt that my mom had pretty much assured me that she and Dad wouldn’t be shelling out the bucks for it. I seem to remember price being a sticking point, like no way was Mom coughing up close to ten bucks for something I couldn’t even play with. As it happened, my mom’s brother, Uncle Rob, spent that Christmas at our house. A little background: Uncle Rob was the youngest “grown-up” that I knew, which made him, you know, cool. Uncle Rob, for example, had bought me a boxed set of “The Hobbit” and “The Lord of the Rings” books when I was in first grade. (I got through “The Hobbit” pretty easily, but I’ll admit it was probably fourth or fifth or maybe even sixth grade before I got through the Ring saga itself. As a little kid, those chapters about “Many Meetings” and “The Council of Elrond” seem like they go on and onnnn.) I remember Uncle Rob being stoked about the then-new Lord of the Rings cartoon movie, and taking me to see it at the theater down by the Gold Circle store. He was going to buy me one of the Gollum posters they had for sale in the lobby, but we wound up seeing the last show of the day, and when we came out of the theater, the concession stand was closed. When he’d visit our house, Uncle Rob would camp out on the floor of my room and we’d stay up late while he told me stories about growing up with my mom on the farm over in Upper Sandusky. When I was a little older, he introduced me to the works of Isaac Asimov and theories about multiple universes and bending space and time. So when Uncle Rob came to stay with us that Christmas, I knew things were going to be fun. Christmas morning, I open up my present from Uncle Rob, and it’s that Empire Strikes Back portfolio! I was just crazy excited because I had completely put it out of my mind, since, after all, Mom had shot it down. There weren’t as many weird pre-production ideas in the Empire paintings as there had been in the Star Warsedition, but these prints were bigger, and the 25-picture collection came with an extra sheet of paper that had information about each one. Later, I sat on my bedroom floor looking through the whole stack again and again. Almost thirty years later, I was watching a DVD made from our old home movies, and I rediscovered that actual moment: Me clutching my pack of Empire paintings in our green-carpeted living room, jumping up to hug Uncle Rob, who, naturally, earned himself a permanent spot on my Cool List. My interview for an NPR Morning Edition segment on the 35th anniversary of Star Wars. Geek-A-Week creator Len Peralta and I recorded a two-part podcast about Star Wars, boom boxes, Halloween costumes and all sorts of other geeky 1980s fun stuff. Listen to the essay which inspired Chapter 1 as it aired on WKSU to celebrate Star Wars‘ 30th birthday. Download an interactive podcast reading – or two – with commentary from Star Wars: The Clone Wars writer George Krstic!